It was Sunday, which meant it was time to take Happy Meal out to do something fun and educational. He chose the Los Angeles Zoo. 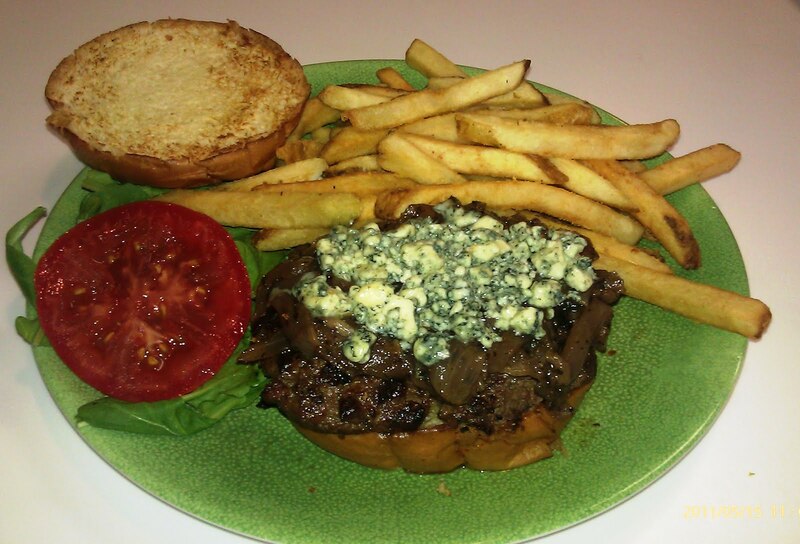 I had been eying Reggie's Bistro every time that we had been to the zoo, since I noticed an Angus Burger on the menu, and today Happy Meal finally relented, and agreed to eat there. 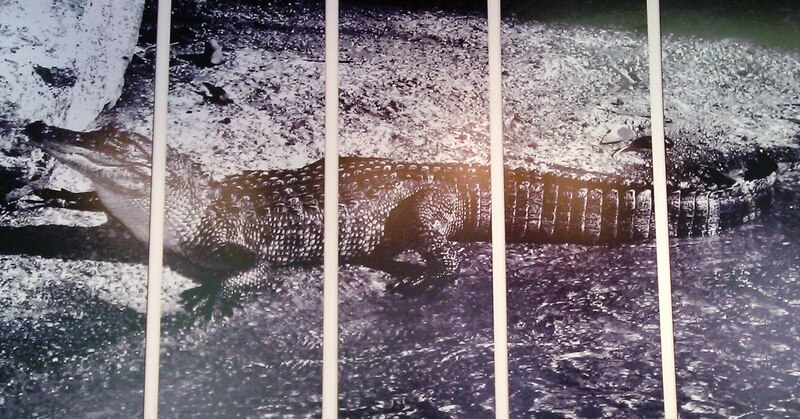 Reggie's Grill was named for the alligator that swims in the pond directly across from the "quick service restaurant". 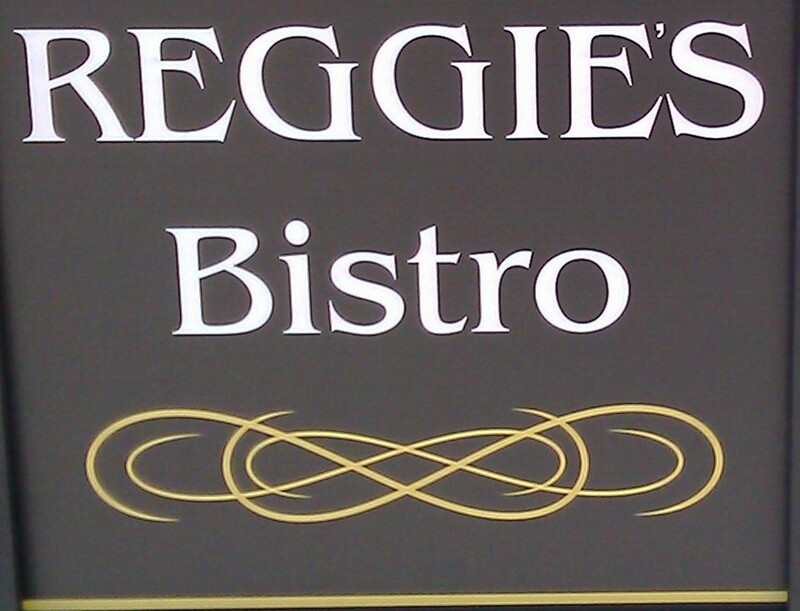 I was keenly aware that trying to find quality food at a zoo was like trying to find quality food at an airport, but Reggie's Grill was an experiment. It was the first establishment in a U.S. zoo to serve made-to-order, gourmet meals on a year-round basis. I spoke with Dereek, who was running front of house at the small cafe--Dereek was very personable and most knowledgeable about the menu and the preparation of the food. Dereek indicated that all of the items on the menu were prepared to order, so Happy Meal ordered a Grilled Cheese, and I ordered the Reggie Burger for $10.95--10% with our Zoo Member discount. The eponymous burger came topped with arugula, tomato, Bleu cheese, and an onion compote. I asked for everything but the cheese to be served on the side. As usual Happy Meal did a better job ordering than I did. The Beef: The burger patty at Reggie's Bistro was 8 ounces of Angus Chuck. The beef in my cheeseburger was aggressively and dramatically over-cooked. As a result, it was dry and rubbery. It has a nice beef flavor to it, and it was relatively lean. That leanness was probably due to the over-cooking, though. There was no trace of aging in the patty. 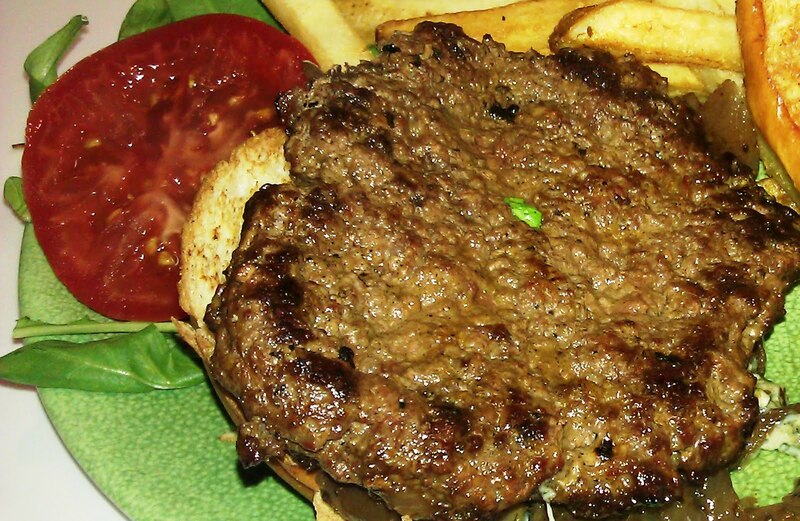 Perhaps this burger would have been passable had it not been vulcanized and leaned on. The Seasoning: There was no trace of seasoning in the blend or on the exterior of the patty. 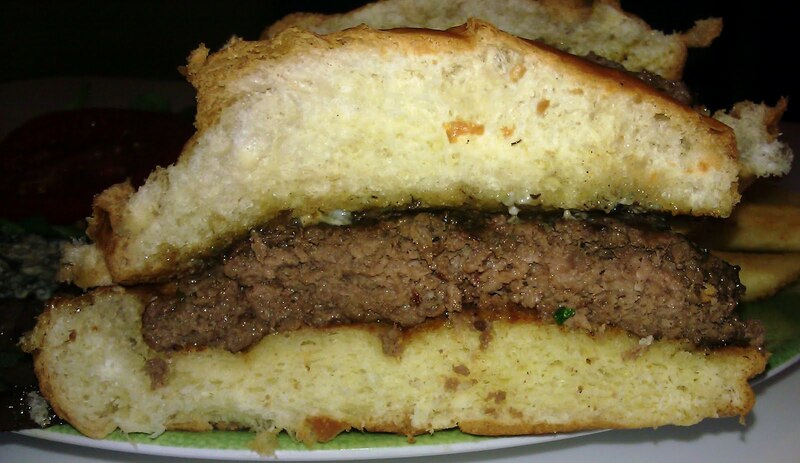 The Sear: The irregular patty received a spotty sear around the edges in spite of being on the grill for far too long. Based on the rubbery texture, I assumed that the person manning the grill had put a lot of pressure on the beef as it cooked to squeeze out all of the juices. All that moisture steaming off would have kept the surface of the burger below the Maillard Reaction threshold of 310 degrees Fahrenheit, and this would explain why the burger was not browned. The Preparation: The hand-formed, flat, Medium-Coarsely ground patties were cooked to Well-Done and then some over a gas grill. I did request that all of the toppings be served on the side, but the onion "compote" arrived on top of the patty anyway. The onion layer acted as an insulator, so the Bleu cheese never got hot enough to melt. 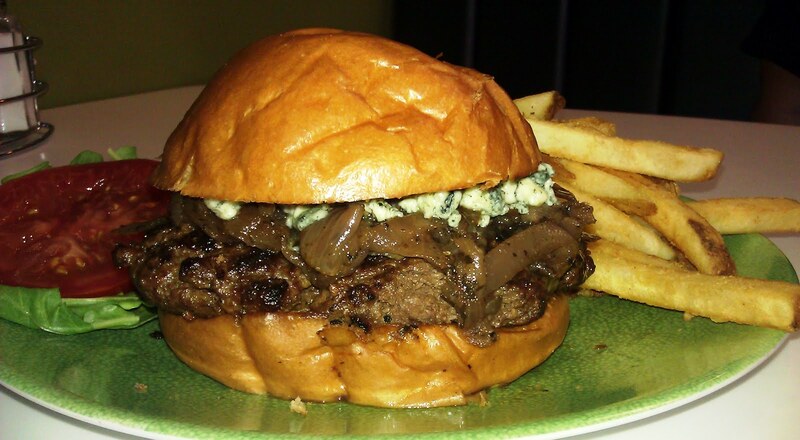 The Cheese: Reggie's Bistro used Bleu cheese on the Reggie Burger. The tangy cheese would have added some much-needed salt to the unseasoned dish, but I didn't ever get far enough to judge that. Since the cheese arrived on a bed of onions, I simply removed those toppings as a single unit. The Bun: This was a competent brioche, but it was freshly oiled, so it was greasy in the hand. I'm not sure who thought that was a good idea, but I blamed that little alligator. It seemed like the sort of thing that an alligator would do. The bun was moist, however. The Meat To Bun Ratio: I only got through two bites, and Happy Meal took only one before he pronounced it awful. The beef was so dry that any bun would have won that battle. The Fries: The fries were golden brown and well-crisped. Unfortunately, these fries arrived pre-cut and frozen in a bag. These particular fries had been treated, so that they had a high sodium content. Accordingly, Reggie's Bistro did not season their fries, since this would have made the sodium levels unconscionably high. The result was some very bland fries, since the brining/preservative treatment did not contribute any noticeable saltiness to this side dish. The Toppings: The arugula and tomato were wonderfully fresh. The onion "compote" was not a compote at all. These were cool caramelized onions. A compote would have resembled an onion marmalade. It would have been sweet enough to be served as a dessert with sugar and other spices blended in during the cooking process. In this case, the sliced onions appeared to have been caramelized with oil and salt and set aside to be used as a luke-warm burger topping. The Value: Happy Meal and I gave up on the Reggie Burger after a couple of bites, and Dereek was kind enough to comp the meal. Happy Meal truly enjoyed his grilled cheese sandwich. The value of the burger in the hands of the kitchen staff of the day that I visited was poor. 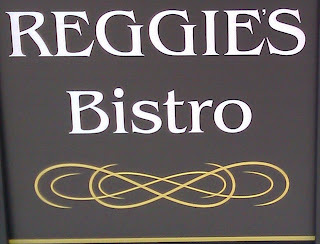 The front of house staff at Reggie's Bistro were terrific, and I would like to imagine that if they employed a similar caliber of staff in the kitchen, then the burger would be something worth ordering. On this visit, the burger was simply inedible. After we had finished up inside, I took Happy Meal over to Reggie's pond. After taunting Reggie for a few minutes--to get him riled up--I heaved Happy Meal into the agitated reptile's enclosure. It went on record as the most savage beating that an 8-year old boy has ever laid down on an alligator in captivity. I think Reggie understood what was going on and why. Burger Review : The good ingredients were overpowered by poor preparation.